View of the Ohio River seen from below Cincinnati. The Ohio River is formed by the confluence of the Allegheny and Monongahela rivers at modern-day Pittsburg, Pennsylvania. It ends approximately 900 miles downstream at Cairo, Illinois, where it flows into the Mississippi River. It received its English name from the Iroquois word, "O-Y-O," meaning "the great river". One of the first Europeans to see the Ohio River was Frenchman Rene Robert Cavelier Sieur de La Salle in 1669. He named the river "la belle riviere" or "the beautiful river." 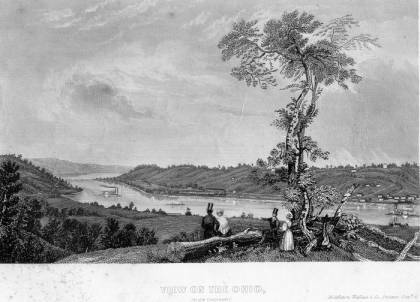 During the 1600s and 1700s, the Ohio River served as the southern border of what later came to be called the Northwest Territory. In several treaties, the river also served as a dividing line between British settlements in Kentucky and American Indian communities in the Ohio Country. The British generally remained south of the river, while the American Indians continued to live and hunt north of it until the end of the American Revolution. As settlers pushed west across the Appalachian Mountains, many of these people used the Ohio River to transport their families and belongings westward. Several of the first permanent settlements by people from the newly formed United States were founded on the river's banks. These places included the towns of Marietta, Steubenville and Cincinnati. During the 1800s, the Ohio River became an important commercial route for residents in Ohio, Kentucky, Indiana, and Illinois. Farmers and manufacturers sent their crops and finished products on flatboats and barges downstream to the Mississippi River and eventually on to New Orleans. Upon reaching New Orleans, freight was loaded on ocean-going vessels for delivery to eastern seaboard ports like Philadelphia, New York, and Boston. This water route was much faster and less expensive than taking goods by wagon over the Appalachian Mountains. Despite the arrival of railroads, improved highways, and air travel, the Ohio River continues to serve as a major artery for transporting bulk items such as coal and grain. The northern bank of the Ohio River also is the southern boundary of Ohio, separating the state from West Virginia and Kentucky.